My last dose of Harajuku lovers was with the limited edition G of the Sea a few months back. Now G must have been hanging around Captain America and his comic-book super hero friends recently because she comes flying back in a Super hero costume herself. This time her creator is Perfumer Christelle Laprade and she joins the rest of the Harajuku Girls perfume collection by Gwen Stefani and represents the super kawaii side to show that pretty can come with a powerful and flirty punch. Decked out in a pop-art inspired blue polka-dot lycra wear, she dons on a red and white striped belt with a Super G logo, eye mask with a red cape flowing from her back. When we first met, I immediately felt the vibrant (overwhelming for some) energy in her with the sparkling pineapple cocktail with hints of citrus tangerine and banana. It reminds me of a delicious tropical pineapple banana smoothie on a long hot day, flirtatiously beckoning to the young at heart to join in on the fun of the evening party. Some might even say Super G would taste like a hummingbird cake if you were to have a bite of her in this gourmand edition. And as the party goes on, she continues to display vibrancy with more banana (banana haters stay clear – you have been warned) and yellow freesia notes before easing into solid base of sweet vanilla, raspberry and warm musk notes. Super G lasts a good 4 hours on my skin and is a scent that would be welcomed by gourmand scent lovers all over! 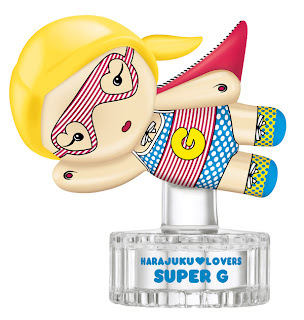 Super G is limited edition so get her quick before she flies out again. 30ml RRP A$49 in Myer, David Jones, Perfume Connection and selected pharmacies nationally from 4th September 2011. A sampler of this product was provided for consideration.